After marching, nay, jogging across London in a game of cat and mouse with police, thousands of students have now occupied Trafalgar Square in protest at the rise in university tuition fees. As the snow falls and the sun goes down, the kettles are coming out. 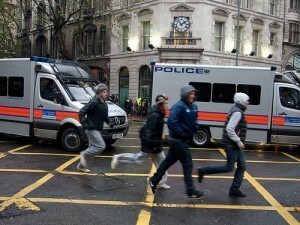 Lines of police prevent the protesters moving towards Whitehall. As with the previous two demonstrations, the mood has been largely good natured, but there have been reports of scuffles and baton-mongery. We'll update this post if anything develops. Image by Johanna in the Londonist Flickr pool.